Visions of Sugarplums Holiday Hop today! I spent an afternoon getting "felt" happy (playing with felt), cutting way too many things out of felt. I now have a small box of Christmas felt die cuts and I intend now to use every last one of them! LOL If you saw my post yesterday you saw some of the results. My cards today also feature some felt cut dies. Have you noticed a pattern or theme with my posts the last couple days? I'll put it another way, do you think maybe I like that stitched tree tag a little? 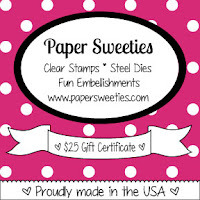 Paper Sweeties is also offering up a $25 Gift Certificate during the hop so make sure and leave comments along your way! I should try die-cutting with felt - these are gorgeous! Love the various colours you used! So sweet cards! Love how the felt matches the paper! Thanks for sharing the idea! oh awesome!!! I betcha these are nice to touch as well as look at! HUGS! I like this tree die and how you've used it, Nance! Great job on using the felt! I love the use of felt. Great idea. Beautiful cards! Love the felt! LOVE that all your die cuts are made from felt -- and stamping on felt ... so clever! Loving the inspiration. 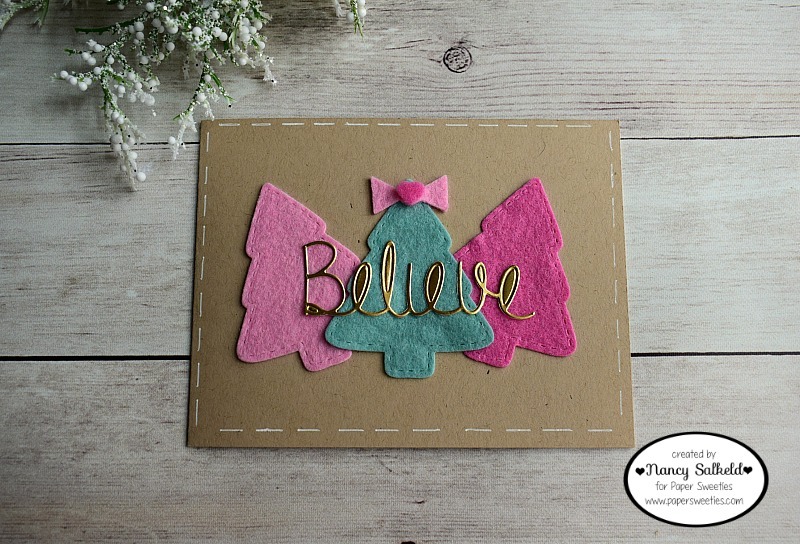 A great card with your felt and pretty gold pop of Believe. The Visions of Sugarplums bloghop has been so fun. I'd love to win any one of the prises. How sweet your cards are with their little felt trees; they make me feel all warm and cozy! Carry on creating with that darling die...I do the same thing when I fall for a particular stamp/die, too! And yes, I'd be thrilled to win! Thank you for another sharing your outstanding inspiration! I have never worked much with felt but these are really cute the way you added felt items to your cards. Great job! such darling felt trees on your cards - love! Very cute felt Christmas trees!! Love the felt! They have made the sweetest cards! Wonderful Christmas cards! Love those felt elements! Such pretty cards! Love, love, love that you used felt! I absolutely LOVE the wool felt trees. It's something that I enjoy using and seeing on projects. SO very sweet, Nancy. Thanks so much for sharing in the Visions of Sugarplums Blog Hop. Oh how I love the felt.....your stitched trees look fabulous, love your cards Nancy! Both of your cards are really adorable. 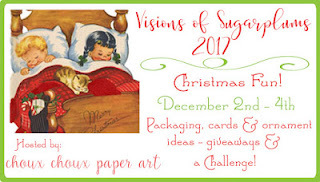 Thanks for sharing in the Visions of Sugarplums Blog Hop. I would love to WIN a prize, but I'm having a whole lot of fun just seeing all the fabulous inspirations!